In February of 2008, Portland Bolt was contacted by a steel fabricator located in Houston, Texas to provide tie rod assemblies for a pedestrian bridge replacement known as the Golden Bridge, located in the City of Golden, Colorado. This state bridge is located on Washington Avenue and spans State Highway 58. 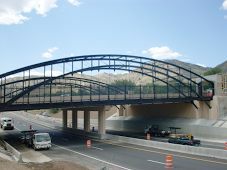 According to the City of Golden, “While the bridge is not a city bridge, the City of Golden decided it was an important enough gateway to the historic downtown, to offer to pay for upgrades and improvements to the bridge, above and beyond the very basic design Colorado Department of Transportation would have otherwise undertaken.” This project replaced the Washington Avenue Bridge over State Highway 58 with two steel-arched bridges and pedestrian plazas at each end of the structure. Portland Bolt manufactured over 8,000 pounds of custom clevis tie-rod assemblies ranging from 3/4″ in diameter to 2-1/4″ diameter and exceeding 26 feet in overall length. Although custom tie-rod assemblies consisting of a turnbuckle in the middle and clevises on each end are not out of the ordinary for Portland Bolt, we were asked to provide specially machined and fabricated clevis ends which did not match any standard design available in the marketplace. Portland Bolt’s ability to provide custom tie rod assemblies allowed the fabricator to complete their portion of the work in the time frame required.